Firebug (as a web developer tool) is primarily dealing with JS objects coming from the currently debugged page. All these objects are displayed to the user allowing further exploration and inspection. Important aspect of the rendering logic is that an object is always rendered using the same scheme (a template) across Firebug UI. It doesn't matter if the object is displayed in the Console panel, DOM panel or inside the Watch panel when Firebug is halted at a breakpoint. It always look the same and also offers the same set of actions (through the context menu). Let's see an example. Following three images show how <body> element is displayed in different Firebug panels. Here is <body> logged in the Console panel. This screenshot displays <body> in the DOM panel. And the last screenshot shows how it looks like in the Watch side panel. The element is always rendered using the same template and also the context menu associated with the object offers the same basic actions (plus those related to the current context). The architecture behind unified rendering is relatively simple. The logic is based on a repository of templates where every template is associated with JS object type (number, string, etc.). When a panel needs to render an object it gets its type and asks the repository for a template that is associated with it. The template is consequently used to generate HTML markup. Firebug uses Domplate engine fore templates, but any other templating system could be used instead. An object (JS object coming from debugged page content) is logged into the Console panel. The panel asks the repository to render the object. Repository gets the right registered template for the object (done usually according to object's type). Finally, the template renders itself using the original object as data. 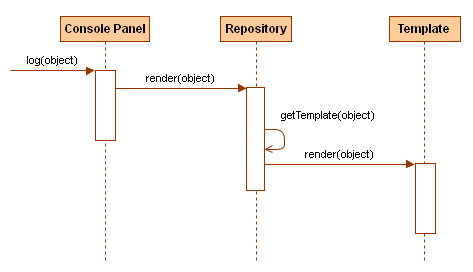 An interface of a template object looks like as follows (again simplified). className Every template should have a classname so CSS styles can be associated. getContextMenuItems Used to get commands that are should be displayed in the context menu. getTooltip Provides a text that is displayed in a tooltip. highlightdObject Can be used to highlight the object within the page if mouse hovers over the object. inspectObject Can be used for further inspection of the object (e.g. selecting the right target panel when the user clicks on the object). See real repository of templates (a template in Firebug is called rep) on github. The entire concept is also nicely extensible. This is great especially for extension (i.e. Mozilla add-ons) authors that can plug in into the logic and customize it. Extensions can provide and register new templates that are rendering specific object types (coming e.g. from JS libraries like jQuery or EmberJS) and define how objects are rendered across entire UI. Extensions can also provide a set of actions that can be performed on existing of custom object types. Extensions can specify new CSS for existing templates and create custom themes.